One of our goals at Expert Testers is to discuss practical topics that can help every tester do their job better. To this end, my last two articles have been about Decision Table Testing and Being an Effective Spec Reviewer. Admittedly, neither of these topics break new ground. That doesn’t mean, however, most testers have mastered these techniques. In fact, almost 50% of the respondents to our Decision Table poll said they’ve never used one. Continuing the theme of discussing practical topics, let’s talk about State Transition Diagrams. State Transition Diagrams, or STDs as they’re affectionately called, are effective for documenting functionality and designing test cases. They should be in every testers bag of tricks, along with Decision Tables, Pair-Wise analysis, and acting annoyed at work to appear busy. STDs show the state a system will move to, based on its current state and other inputs. These words, I understand, mean little until you’ve seen one in action, so let’s get to an example. Since I’m particularly busy (i.e., lazy) today, I’ll use a simple example I found on the web. Below is a Hotel Reservation STD. Each rectangle, or node, represents the state of the reservation. Each arrow is a transition from one state to the next. The text above the line is the input–the event that caused the state to change. 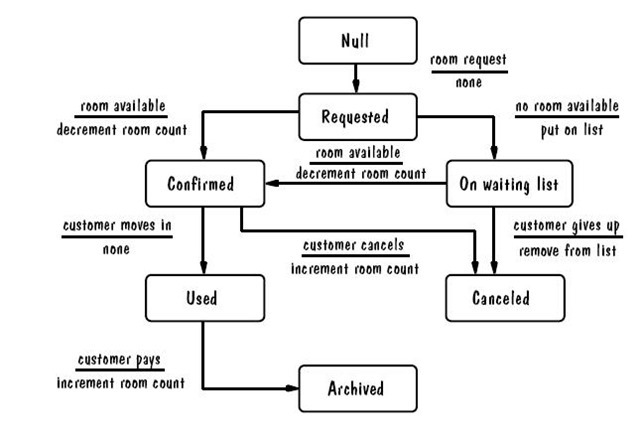 The text below the line is the output–the action the system performs in response to the event. One benefit of State Transition Diagrams is that they describe the behavior of the system in a complete, yet easy-to-read and compact, way. Imagine describing this functionality in sentence format; it would take pages of text to describe it fully. STDs are much simpler to read and understand. For this reason, they can show paths that were missed by PM or Developer, or paths the Tester forgot to test. I learned this when I was testing Microsoft Forefront Protection for Exchange Server, a product that protects email customers from malware and spam. The product logic for determining when a message would be scanned was complicated; it depended on the server role, several Forefront settings, and whether the message was previously scanned. The feature spec described this logic in sentence format, and was nearly impossible to follow. I took it upon myself to create a State Transition Diagram to model the logic. I printed it out and stuck it on my office (i.e., cubicle) wall. Not a week went by without a Dev, Tester, or PM stopping by to figure out why their mail wasn’t being scanned as they expected. If you read my article on Decision Tables (DTs), and I’m sure you didn’t, you may be wondering when to use an STD and when to use a DT. If you’re working on a system where the order of events matter, then use an STD; Decision Tables only work if the order of events doesn’t matter. Another benefit of STDs is that we can use them to design our test cases. To test a system completely, you’d need to cover all possible paths in the STD. This is often either impractical or impossible. In our simple example, there are only four paths from start of the STD to the end, but in larger systems there can be too many to cover in a reasonable amount of time. For these systems, you can use multiple STDs for sub-systems rather than trying to create a single STD for the entire system. This will make the STDs easier to read, but will not lower the total number of paths. It’s also common to find loops in an STD, resulting in an infinite number of possible paths. When covering all paths is impractical, one alternative is to ensure each state (node) is covered by at least one test. This, however, would result in weak coverage. For our hotel booking system, we could test all seven states while leaving some transitions and events completely untested. Often, the best strategy is to create tests that cover all transitions (the arrows) at least once. This guarantees you will test every state, event, action, and transition. It gives you good coverage in a reasonable amount of tests. If you’re interested in learning more about STDs (it’s impossible to cover them fully in a short blog article) I highly recommend reading A Practitioner’s Guide to Software Test Design. It’s where I first learned about them. The next time you’re having trouble describing a feature or designing your tests, give a State Transition Diagram or Decision Table a try. The DTs and STDs never felt so good! When I logged into the blog today, I found that WordPress generously prepared a 2012 Annual Report for Expert Testers. If you like fireworks and useless stats, check it out.